Max the cat has had quite a busy few weeks. 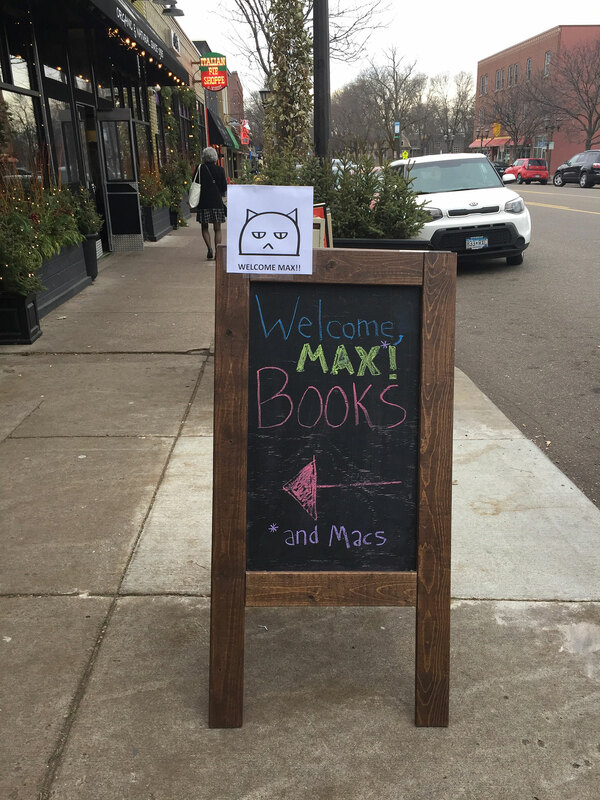 In early November, Macalester College professor Rebecca Wingo snapped a photo of a certain sign at the school’s DeWitt Wallace Library targeting Max and posted it on Twitter. A few weeks later, it showed up on Tumblr, then Reddit. Suddenly, Max was launched to global Internet fame. It also introduced Max’s owner, Connie Lipton, and the sign’s creator, senior library associate Chris Schommer, who had never met before. 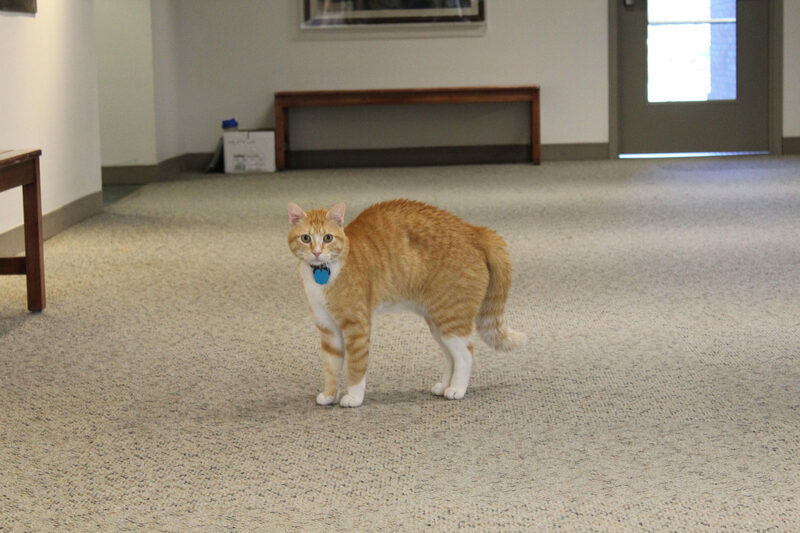 In fact, even though Schommer knew all about Max—whose wanderings over the past six months or so had earned him a reputation as Macalester’s “campus cat”—he had never actually spotted him himself. Everybody in the area knows Max, Lipton says, noting that he’s made his way into various classroom and dorm buildings and even shown up at a party or two. He’s also ventured beyond campus, wandering down Grand Avenue to hang out with diners on the patio at the French Meadow Bakery. But, as the pair explains, by the time the story went viral some three or four weeks after Schommer originally put up the sign, it had already been taken down and Max had been placed under house arrest. 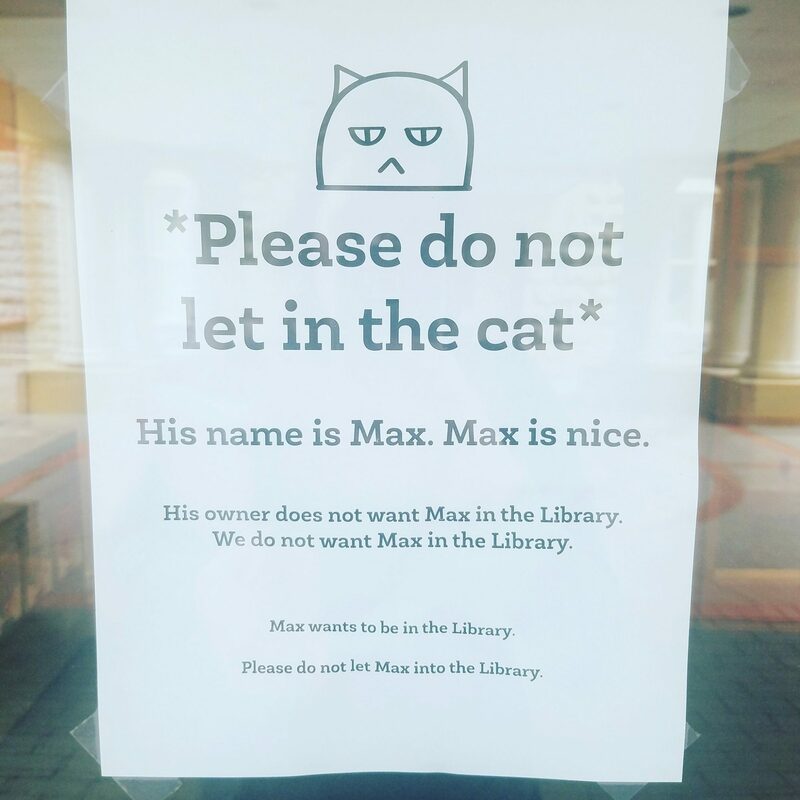 In addition to the reasons that led to the sign being posted in the first place—a library employee with a serious allergy and worries about Max being accidentally trapped in the building at the end of the day—a new construction project on campus has made things a little too dangerous for the cat to keep wandering on his own. 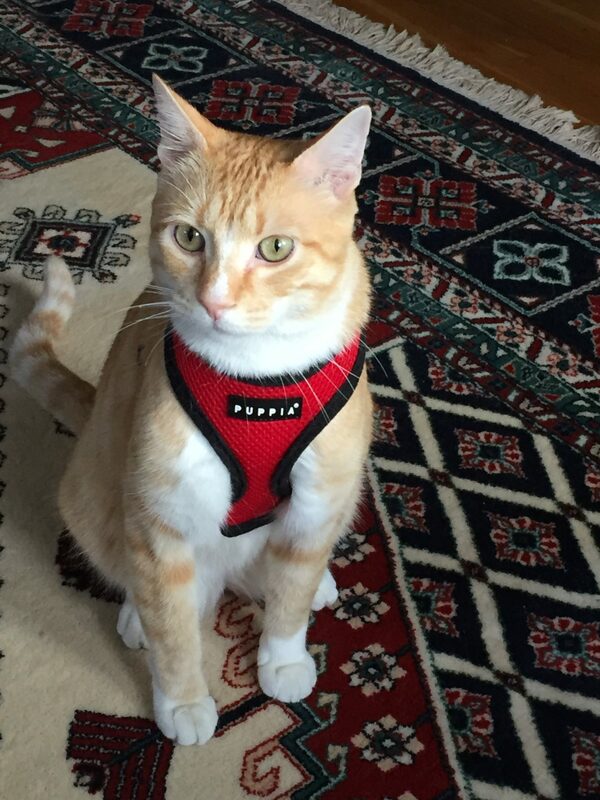 He’s definitely not happy about it, but Lipton is working on a compromise: harness training, which she’s had a lot better luck with than a lot of cat owners who make the attempt. “He’s fine on the harness. It’s just getting him to actually walk where I want him to,” she says. The idea of writing a book about Max also came up pretty much immediately. Many users online commented that the whole thing seemed like it was right out of a children’s story: “This is basically halfway to being a children’s book,” tweeted children’s author Erin McGuire when she shared the photo of the sign. Even before he had any inkling that the whole thing would blow up, Schommer says, “I thought of it as a story in my head.” But when everything went viral, he and Lipton decided to put things down on the page for real. They are working with artist and web developer Gamze Genc Celik, whose free-use cat illustration Schommer used on the poster, to create a bona fide children’s book. “It’s been my obsession for the past two weeks,” says Schommer, who’s been learning a lot about the publishing process. It’s still a bit early to say when the book will hit shelves, but he and Lipton are hoping to have it written in January and go from there. You can visit LetMaxIn.com to sign up for updates on the process—and in the meantime, you can buy a coffee mug with that adorable cat face on it here. For anyone worried about the endeavor turning into a cynical cash grab, rest assured that there are worthwhile plans for any money that may come in. In addition to the possible nonprofit, Schommer and Lipton are looking at donating to reputable cat rescues in the area. Above all, everyone is just glad to have had a hand in a positive news story that’s made a lot of people smile. “People love libraries, people love cats, the Internet loves all those things . . . there’s definitely been a genuine emotional response from people about Max and what libraries mean and the positivity of the whole community around Max,” says Schommer. 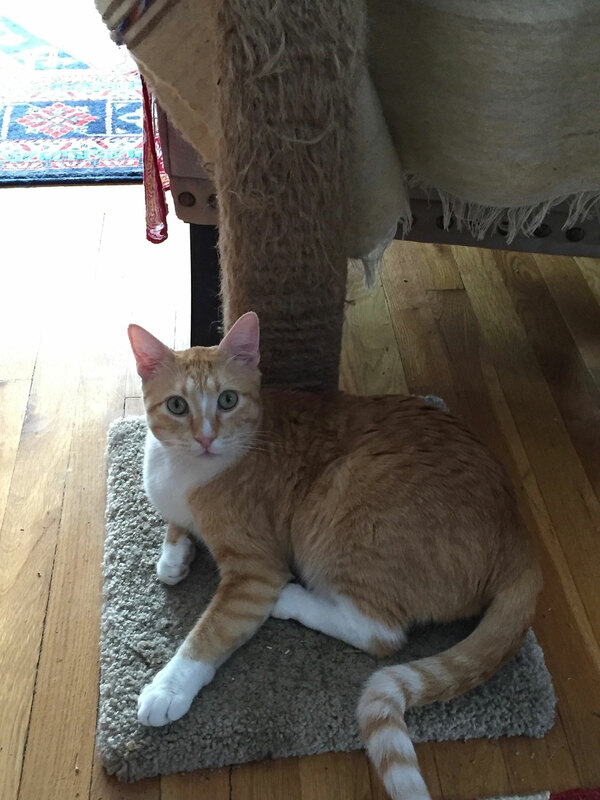 You can follow Max’s adventures and those of Lipton’s less famous cat, Gracie, on Instagram at @cool_cat_max_and_gracie, and Lipton has just created a brand-new YouTube channel. Keep up to date with news about Max and the forthcoming children’s book on Twitter (@Max_Library_Cat) or at LetMaxIn.com. Chris Schommer and Gamze Genc Celik are also on Twitter at @cschommer and @gamzegenccelik, respectively. Who Really Comes Out on Top in the Battle of Batman Versus Superman?